Smarter Balanced Teacher: Currently Prioritizing and a WINNER! Currently Prioritizing and a WINNER! Oh, me, oh my, it's May??? This school year has literally flown right past me! I need another nine weeks grading period to finish all the plans I had for my kiddos! Really, we've covered just about everything in reading and writing, but the 'rithmatic? Not quite there yet, and we're feeling the test anxiety about taking the MAP testing next week...After a slam, bam review, I have to squeeze in at least one game of circles and stars (awesome game to introduce multiplication), get on board the rounding train, and throw in some geometry. Now how am I going to do that in four days, plus go on an extended-day field trip? No idea...if y'all have some, lay 'em on me! I am happy to announce that Heidi at In That Room is the winner of my Fab Forty Giveaway. She has won four products from my TPT store. Congratulations, Heidi! 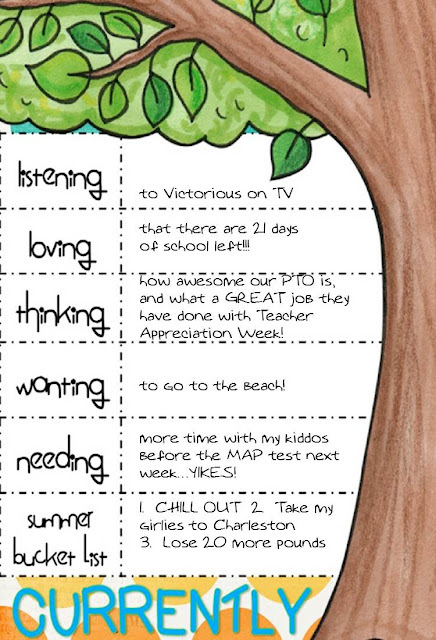 I can hear my girls watching Victorious in the den, as I write, and although I am loving that there are only 21 days of school left, because I'm wanting to go to the beach, I'm also hating it, as you can see by the fact that I am needing more time before testing...talk about confusion! That is an awesome talk to have with an admin! That is so hard to do though. It is always a balancing act, isn't it? Aren't PTOs just the best?! Our PTO works really hard to help the teachers. I'm your newest follower! Thanks for following! Our PTO is brand-new, having just converted from PTA this year, and they ROCK! I am so with you on wanting more time before testing. My class is the opposite of yours. We're good on math, but I wish we had about six more weeks to work on reading! Oh well, at least we have the summer to look forward to! Okay, I say we're good on reading. All that means is I've covered all the CCSS standards. I'd LOVE another six weeks in both! Have a great summer in NC, from SC! Yes to the beach and to tan!! Tan...I forgot about tan! My daughter, who's Chinese, always tells me I'll never catch up, and she's right. She gets brown as a little bug! Thanks for following - I'm heading right over to see you. Popping over from Farley's link up! The Beach is listed on my bucket list, oh about 10 or so times! I totally feel ya! I'm also a new follower! Oh, thanks for following, Nicole! I can't wait to see your blog, as a fellow 2nd grade teacher. As for the beach, I wish I could just live there all summer! I am so excited! I will get back to you on Monday with my choices! Yay! I'm excited for you, Heidi - have fun out of town, Monday's great! Hootin' & Hollerin' for Hoots N' Hollers! Monday Made It and a FREEBIE! Five for Friday on Mothers' Day??? Whooo's Having a Teacher Appreciation SALE?? ?